Ben Ellwood – Stats and spreadsheets. I've been dabbling at doing the internet since the late 90s. For the past seven years I've been doing it properly on the content team at English Heritage, who have recently become Historic England. During the confusion I've become Audience Insight Analyst in Historic England's new marketing department. It's giving me a lot more time to understand and evaluate things. And make spreadsheets. So I thought I might write a bit about that. Google Sheets has a formula that lets you scrape values from a website: =importxml(). Get a list of your web pages (you can do this by importing your xml sitemap into Google Sheets) and then use the =importxml() formula to scrape values for things like metadata title and description, or on-page text like your Heading 1. XPATH: is the description of the content you’re requesting. w3schools.com has a pretty useful overview of the syntax. There seems to be a hidden speed limit; I find that the first few hundred fields will populate really quickly but then it really slows down to just one cell updating every 10-20 seconds. Making a cup of tea or writing a blog post about it can help kill the time. You can fetch multiple values in a single request. I presume this will help speed up the process but I don’t have it working reliably enough to use it in place of the above method. Use a pipe separater in the XPATH value to request more than one item. The problem I find with this method is that it gives the results in the order they appear on the page, not the order you request them. For me it returns Title, Description, Keywords, H1 because that’s the order in the HTML I’m scraping. The bigger problem is that where a field doesn’t exist, its column doesn’t get skipped. Where keywords are blank it doesn’t leave a blank cell, it shifts the H1 into the column that contains keywords for other pages. You can only really use this then for fields you know will be filled in. The value gets cached in Google Sheets for a few hours before it will fetch new content. Before this happens you should copy and paste as values to overwrite the formula with the content it fetched. Put the formulas in for the first page, and drag the formulas down to autofill about 50 rows. 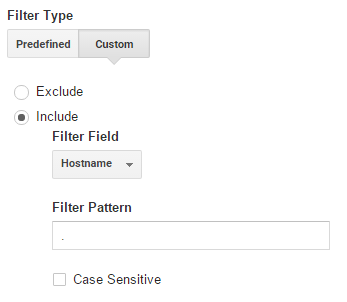 There’s a growing problem of spam traffic in Google Analytics, but recently I’ve been able to eradicate most of ours with one very simple filter. Google analytics is a pretty open system. The account ID is all that’s needed to push data to your reports and these IDs are numeric so it’s easy for them to automate account IDs and have their servers push pageview and event data straight into your account. When something like a pageview is recorded in Analytics there are also a lot of secondary dimensions recorded that you can use to verify whether it’s spam or not. I used the Hostname dimension. It records the domain that the visitor was viewing when triggering the pageview. By adding the hostname secondary dimension to pageview, referral and event reports I realised that this was missing for the fake spam data. 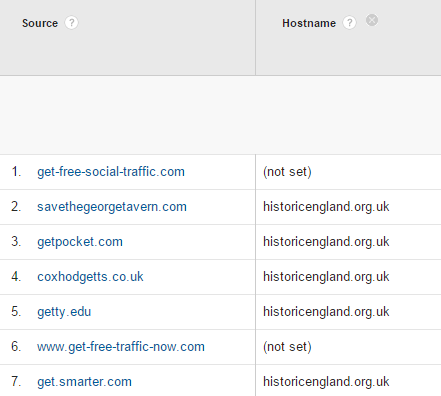 In the screenshot you can see genuine referrals with the hostname set to historicengland.org.uk. The hostname for spam traffic was (not set). When I first tried to filter traffic based on hostname I set up a filter to exclude hostnames matching “” (blank) or “(not set)” but I discovered that a blank hostname is not the same thing as a missing hostname. Only include traffic where hostname equals . The full stop is a regular expression wildcard for any 1 character. Another option would be to specify your domain name, but I felt that that approach was too specific. There are genuine reasons for using alternative hostnames, like Google Translate. Also in case the domain for our website did ever change then I didn’t want the Google Analytics set up to be so heavily customised that the rest of the team might change something which stops it working. There are some other links which I used along the way to understand the issue, but they tended to rely on individually filtering out specific referral sites and I didn’t want to have to keep on top of that! I’ve been building on that recently and thought I’d share a few ways I’ve been using it. I wanted to get my sitemap data into Google Sheets for a few content audit and statistics dashboards. The IMPORTXML() function in Google Sheets sounded pretty self explanatory and the XPATH syntax seemed almost graspable. But it just wouldn’t sodding work.